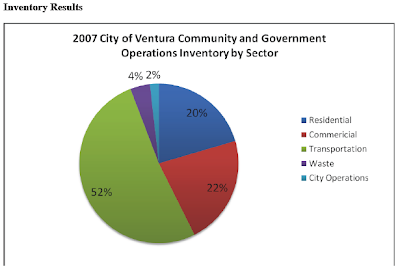 A student group from the Bren School of Environmental Science and Management at UCSB presented their project which will feature Ventura as a model city working to reduce community carbon emissions. The goals of the study are to determine what to do, how to do it, and how much it will cost. Around the world a selection of “Pioneer Cities” are undergoing similar projects. Ventura will be linked to Wuxi, a city on the Yangtse River in China. The group in Ventura on Wednesday night included a student from China, who also presented some insights from his country. The study will have three steps. Bren students will evaluate our carbon footprint as a community. They will design a menu of strategies for reducing our greenhouse gas emissions. Then they will develop a feasibility analysis of the political and economic factors of our community. In addition to a set of recommendations for Ventura they hope to create a toolkit adoptable to other communities. Of note was a 'wordle' taken from their initial work. (Wordles are like the label cloud on this blog, or this.) In this case, Water turned out to be the primary word. The group discussed how low flow shower heads and other water conservation measures can reduce carbon emissions - yes, saving water reduces energy used in pumping and heating the water we use on a daily basis. The project web page has a wealth of information on the project and references on technologies and strategies. We can look for the results in the spring of 2010.